An electrician has completed a training course that allows him to work with and understand the dangers of the maintenance and installation of electrical wires – in a home, office or commercial or industrial property. A career in the electrical industry is a popular career choice, a good electrician has completed his or her training and yet continues to learn by keeping up with electrical advancements, tools and gadgets and who possesses very good communication and *people skills*. Here we’ll look at the process for becoming an electrician. An electrician undertakes a 3 to 5 year apprenticeship where they learn and train via a combination of in class instructions and on the job training. Classes are for learning electrical theory, code requirements, how to read blueprints, how to use a soldering iron along with basic first aid and safety. Electricity is powerful and in many cases you don’t get a second chance if you make a mistake. 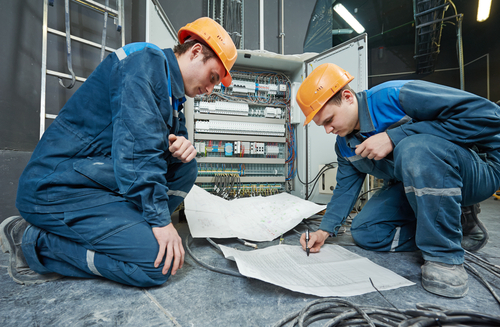 On the job training requires you to take on an apprenticeship with a licensed electrician who provides real training outside the class room; you are shown what an electrician does and may be given some duties to perform. Electricians work in many fields – construction, residential, commercial, and industrial. In the construction industry electricians will install wall conduits, wiring, install power points and light switches in new buildings – homes, office, apartments etc. When construction is finished the electrician will be back to mount outlets, circuit boards and other electrical jobs required for the building to have lights and power. The work of the electrician is a necessary skill thanks to our growing dependence on electricity; we all need and use electricity, from cooking and keeping food cold, to washing our clothes and cooling our home. Without electricians we couldn’t survive! Electricians also repair and perform safety checks on electrical systems and wiring in your home, place of business and in commercial businesses and industrial estates. Electricians need to learn to read blue prints – they learn this in the class room and it an essential skill needed for working in schools, hospitals, shopping centres and even homes as blue prints show the electricians where the circuit boards, power points and load centres are located within a building. When an electrician has completed his training/apprenticeship he is fully licensed and able to work either on his own as an independent contractor, or he may be employed by an electrical firm. An electrician is bound by a code of practices and set rules and regulations, but most importantly he is someone who knows what he is doing. Have a methodical approach to your work. Are you looking for work as an electrician or currently work as one? We’d love to hear your thoughts in the comments below!